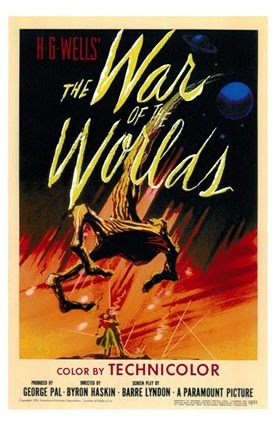 The War of the Worlds is classic 1950's Sci-fi based on the novel by H. G. Wells. It's a "cast of thousands" end of the world drama with lots of those cheesy 1950's special effects we know and love. Byron Haskin [Robinson Crusoe on Mars, Treasure Island] directed this film. He spent his early years in Hollywood designing special effects so he's the perfect director for this movie. He also had the one and only Cecil B. DeMille (uncredited) as well as George Pal [director of The Time Machine and Atlantis, the Lost Continent] as his producers. It's hard to go wrong with that. The set up is simple: A mysterious asteroid crashes in a remote area outside of town…but it's no ordinary meteor since it holds a Martian spaceship. You probably know where it goes from there! The cast is fine but only Les Tremayne [Bonanza, Perry Mason] stands out as Major General Mann. He has a commanding presence on screen that is hard to ignore. The two romantic leads are another story altogether. Gene Barry is Dr. Layton Forrester. He's the main scientist who is trying to figure out how to defeat the Martians. His performance is a little lethargic at times. This is due to his eyes which are often expressionless. His main squeeze is 1950's femme fatale Ann Robinson who plays Sylvia Van Burren. Unfortunately, they give her far too little to do in the movie except scream hysterically and fall into the arms of her man for protection. She also cooks breakfast in an abandoned farm house like any good 1950's housewife would do! Sigh. A little extra treat is the one and only Sir Cedric Hardwicke [The Ghoul, The Invisible Man Returns, The Ghost of Frankenstein] who does the voice-over commentary in the film. He gives it the gravitas one would expect from such a horror icon. A really good reboot of The War of the Worlds was done in 2005 starring Tom Cruise and Dakota Fanning. This modern remake ups the special effects and increases the drama and suspense tenfold. Don't miss this classic film!